Brands and Bloggers (or 'influencers') are working together increasingly more, which brings exciting opportunities, dream collaborations and the opportunity to turn a hobby into a job. Though blogging isn't my job, I have had the honour of working with many incredible brands over the years. I started this blog back in 2013, firstly focusing on beauty, then weddings and most recently my journey into parenthood. Over these years I've worked really hard to improve my photography, find my writing style and build up my blog's readership. As a result, I am lucky enough to collaborate with brands every now and again. I thought it might be interesting to share how I approach brand work on my blog and social media platforms, especially focusing on the photography side. After discussing with a brand what is required for the job (how many blog posts/social media posts/information included etc.) I will then start planning how to achieve the desired outcome. Sometimes I make notes on my phone or in a notebook, but most of the time this planning process goes on in my head. I always take working with brands very seriously and approach the work as professionally as possible. Essentially, I want to do the brand justice and produce high quality content. One of the first things I'll do is look at a brands Instagram page, so that I can see if they have a particular style of photo on their feed (dark, atmospheric, light, airy, indoors, outdoors, candid etc.). I find that brands often ask to repost the photos I may share on social media, so I always aim to try and keep in-line with their theme (without every compromising my own). I'll then think about the type of photo I hope to take, which will showcase the product, as well as fit my photography style. I love taking photos outdoors, not only for the natural light but because Isabella loves nothing more than exploring outside. Since receiving my first DSLR camera at Christmas I will now always shoot in RAW, so that the image quality is the best it can be and it makes editing easier too. I also shoot on the auto mode because I am just not competent enough to make the switch to manual yet! Having said that, if there is a specific photo I want to try and take I will do the research and set the camera to the right settings prior to going out. This means I can quickly try and take the desired photo without guessing which settings I need to change etc. An example of this, though not brand work, was when we visited Elan Valley in Wales recently. There are several huge dams there and I really wanted to try and take a photo of the water running, rather than capturing a still shot. I researched the necessary settings (I believe it needed to be a longer exposure) and simply had a go. You can see my attempt in the third photo down in this blog post, trying new photography techniques is exciting and a great way to keep things interesting. As I'm thinking about the style of photo I'll also consider where would be best to photograph the product. A lot of the time I'll plan a day out somewhere specifically to take photos, such as a day out in the Cotswolds to showcase the JoJo Maman Bebe S/S '18 Collection or Stamford to test-drive the new Diono Quantum Premium. I love that blogging encourages us to explore new places and once the photos are taken we can enjoy a family day out together. Sometimes it can be quite stressful planning to photograph on a specific day in a different location, as there is so much you can't control. The weather, lighting, if Isabella will accidently fall over and get the clothes I'm trying to photograph dirty, whether both children will be in a happy mood, ensuring no one else is in the background of the photos...the list could go on. My husband is really good at taking the odd photo too, which helps if I need to be in the shot. It is always a big relief once we have the photos taken! The next big job is going through the photos and selecting the ones I want to edit/use. I tend to go through them first on my camera, deleting any blurry ones or ones I know I won't use. The next step is to upload them to my computer and go through them again. I use the Canon Digital Photo Professional 4 programme (it came free with my camera) to edit my photos, but have previously used PS Express app and Picmonkey. I find that editing takes more time than I always think it's going to. It's not as simple as editing each photo individually because they all need to sit next to each other within a blog post, so they need to look similar with regards to colours, lighting, contrast etc. If I've taken the photos on a cloudy day (my personal favourite type of natural lighting, as there aren't any harsh shadows that bright sunshine can create) then I'll tend to just up the brightness, contrast, shadows and colour saturation slightly and then decrease the highlights. I am by no means an editing whizz though, so it takes me a long time to get through a blog post full of photos. After the photos are taken and edited I'll upload them into the blog post template. I find that having the photos there while I'm writing the post can help with inspiration and aspects I want to talk about. It's then all about writing the content, which often involves research and finding some time away from the children to fully concentrate. I'll then organise the photos within the blog post, usually linking them up to the text, for instance if I'm talking about the wheels of a pushchair then the photos of the wheels will be next to it. One of the last parts of writing a brand (or any) blog post is creating the image I have at the start of every blog post I write, which includes the title and an image from the blog post. I make these in Canva and they're pretty quick to create once I've decided on a title and the images are edited. The final thing to do is to check the blog post in preview to ensure the images and text are all formatted correctly and then have a read through the whole post. Once I'm happy with it I'll either schedule it if it's going out within the next few days or save it to drafts. I'll save it into drafts, rather than schedule it, just in case I think of something I want to add or change prior to publishing. After finally hitting the publish button it's then on to publicising the post across all social media platforms, scheduling tweets, answering comments, further editing photos ready for Instagram and Facebook posts, emailing the brand a link to the post/social media posts and joining up with any relevant linkys. All in all the process of creating a blog post is very time consuming, but I love it and am always so honoured that brands want to work with me. 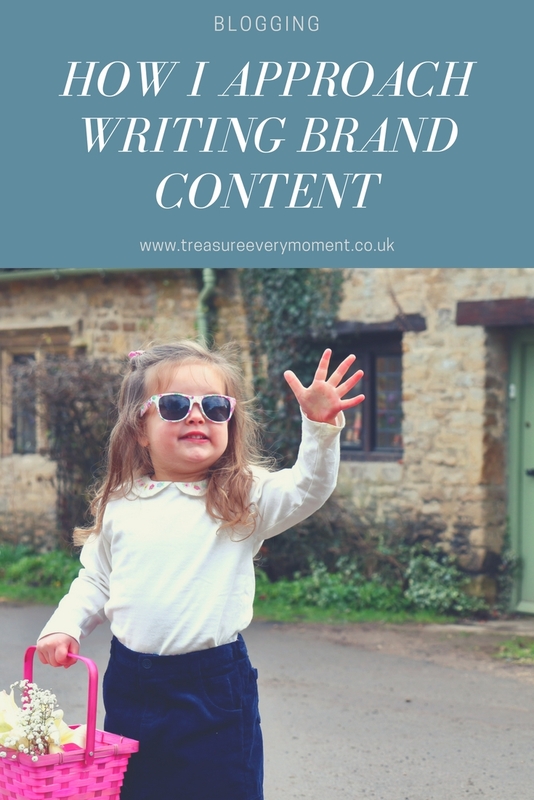 I hope this has given you a bit of an insight into how I go about planning, preparing, photographing, editing and creating brand content on my blog, as well as perhaps show how nothing is 'free' when it comes to blogger/brand collaborations. These are great tips. I'm a bit over productive on the photo front and could probably do with narrowing them down a little!! This is really interesting. It's always lovely to hear how other bloggers work. I am the same of you and really try to get a feel for a brand's style before taking any photos. And yes - editing always takes such a long time! I love how you have shared what goes on in a brand collaboration. I am sure this info would help many bloggers. Interesting to hear how others do it, great tip on the clients Instagram!